Phyllo dough is one the most versatile pastries around, and phyllo dough dessert recipes are able to live up to that versatility as well. Phyllo dough, or filo dough, is a thin pastry that is baked in layers or sheets. It can be made into savory or sweet pastries including spinach pies or puffed pastries and is used throughout all Middle Eastern cooking. Phyllo dough can be difficult to work with the first time. When making phyllo dough, be sure to follow these tips to help your pastry turn out easier. Each of these recipes begins with a simple phyllo dough recipe that is formed into the perfect puff pastry or layered dessert. 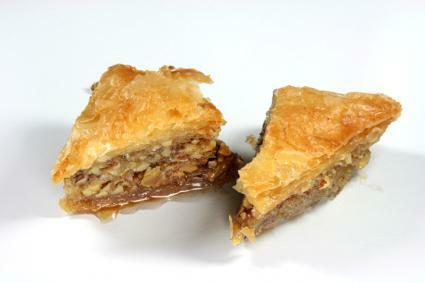 Baklava or baqlawa is a layered nut dessert found in Greece, Lebanon and Turkey. The filling can vary based on taste and personal preference, but should contain a mixture of nuts for best flavor. Knafeh is a sweet cheese pastry that is eaten for breakfast in Lebanon. Serve it as a warm dessert after dinner. Phyllo can be a difficult pastry to work with for the first time. It does recombine easily, however, and can stay separated with melted butter. Leave plenty of time for yourself when making any phyllo dough dessert recipes to recombine or layer the dough. With practice you'll be making phyllo dough desserts and puff pastries with ease.